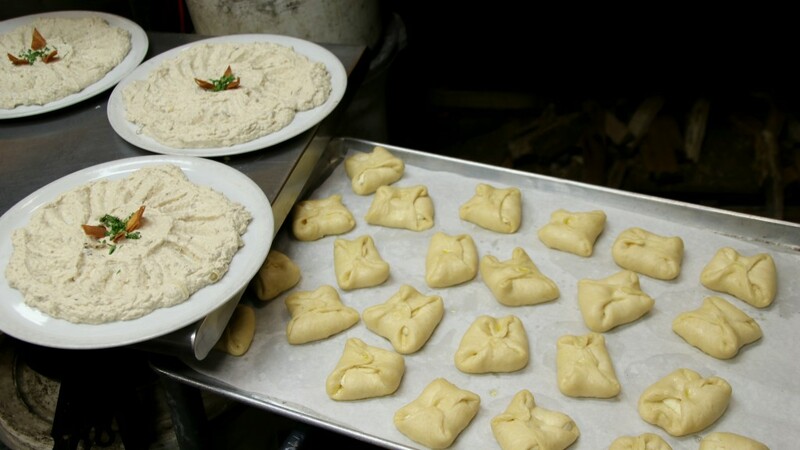 Instead of the typical pizza and pasta served at Hersh’s in Federal Hill, the kitchen tables were laden with baba ganoush, stuffed zucchini and cheese-filled pastries, Syrian-style delicacies prepared by Iman Ashab. 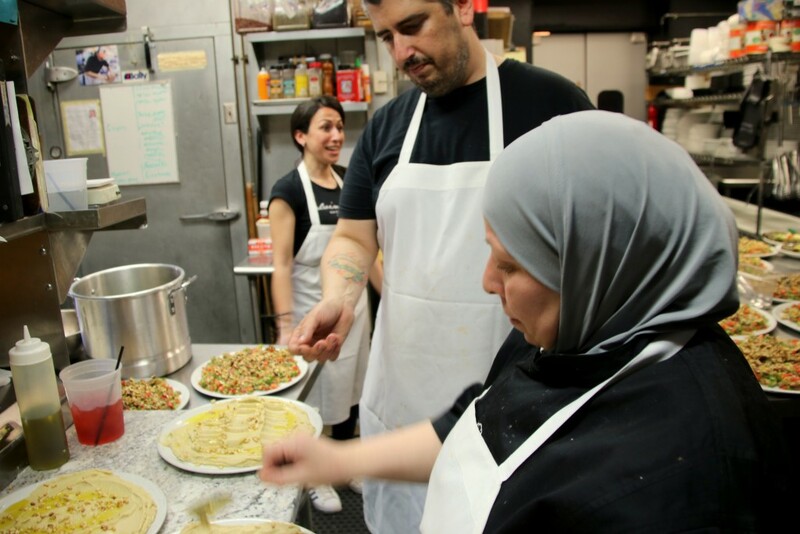 A refugee from Syria who moved to Baltimore in December, Ashab was the featured chef at a fundraiser this week organized by refugee support group Mera Kitchen Collective. 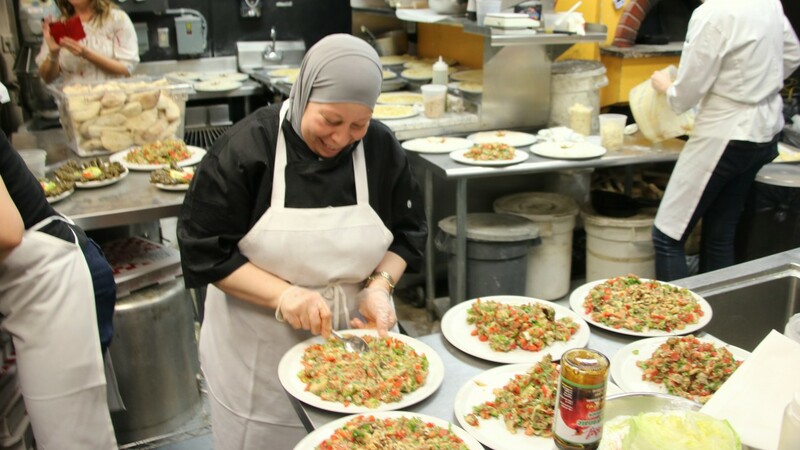 Drawing on her past experience as chef at the Four Seasons hotel in Damascus, she had no hesitation instructing owner-and-head-chef Josh Hershkowitz in how to give the dishes a distinctive Syrian touch. As he was about to send out the plates of hummus, for example, Ashab stopped the process and took a spoon to each one, pressing more aesthetically pleasing crescent shapes into each bowl. 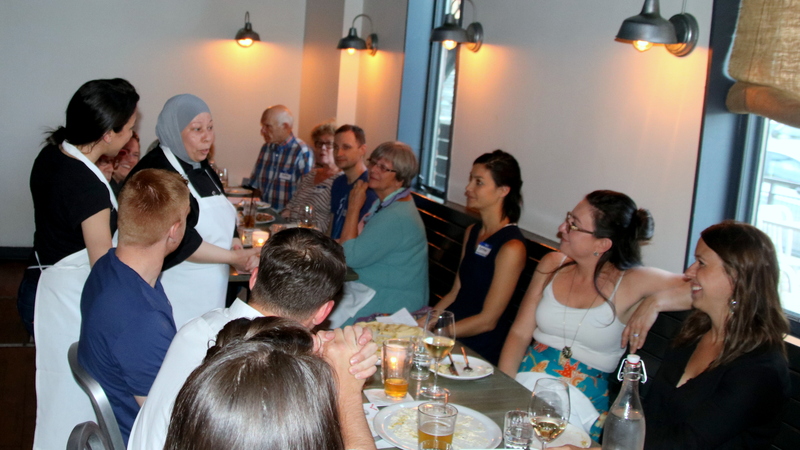 More than 60 people attended the dinner event, titled “Wonders of Damascus,” the first of what the collective envisions as a series of such meals prepared by other foreign-born cooks to raise money to help Baltimore’s refugee community. For the organizers, the evening was a tasty way to support a cause. Each year more than 700 refugees resettle in Baltimore from more than 17 countries, including Syria, Eritrea, Sudan and Burma. Several groups have been established around the city to aid these families that often come to Baltimore from war-ravaged places and lives of poverty. Refugee Youth Project, for example, provides academic help to recently resettled children. An initiative of Baltimore City Community College, the project includes after-school programs at three locations, an art program and a mentoring program that pairs children with volunteers who help with homework and teach English. The IRC helps about 1,100 refugees each year find housing and jobs in Baltimore. Other ways IRC assist them include helping pay rent, finding health care and affordable food, and providing legal services to help attain citizenship. The Mera Collective, a food-based cooperative focused on the empowerment of refugee and immigrant women, is there to support all these efforts. For Ashab, it has been a way not only to help others but to feel again at home in a commercial kitchen and show off her cooking, a skill she said many refugees possess. Her move to Baltimore was the culmination of a lengthy application process enabling her to escape from the civil war in Syria, which has led to more than 5 million of its inhabitants fleeing the country. In 2011, Ashab said, her house in Damascus was bombed by the Syrian military, killing her husband and granddaughter while she and her three children were away from the building. Now she lives alone in Northeast Baltimore, working at a sewing factory and cooking as a volunteer for Mera Kitchen Collective in the evenings with a hope she can someday be reunited with her kids. As Ashab went around the restaurant’s tables to thank the customers, she would sometimes reveal her sadness that her three children couldn’t be there with her, one of whom is a professional chef back in Jordan. “Most of all I’d like you to try the rice dish. It was my son’s favorite thing and I miss him so much,” she said. The Middle Eastern menu Ashab assembled took a lot more time than Hersh’s was accustomed to – preparation for Tuesday’s dinner began before noon. Still, Hershkowitz said he was glad to escape the restaurant’s daily routine to get more involved with the refugee community – a group he said doesn’t get nearly enough support from Baltimore residents or the food industry. “Of course, it feels great to be doing something like this, because nobody else is doing a goddamn thing,” he observed. The owner also hopes to incorporate more refugees into his restaurant as workers. “It’s one thing to do something like this [fundraiser], but there’s the whole ‘give a man a fish, or teach him to fish’ thing, right?” he said. Hershkovitz was not surprised by the departure of more than 30 employees from BoatHouse Canton, saying it was just Trump carrying out the actions he promised in his campaign. Even though the two cooks often needed friends or IRC worker Aishah Afladhallah to translate from Ashab’s Arabic, the two got along well. Ashab confided that she hopes to one day run a similar restaurant. The food industry may be a tight-knit group, but so is the refugee community. Bringing the two tribes together may prove to be the real genius of the Mera Kitchen Collective. “I often think to introduce people during my IRC work,” said one of the collective’s founders, Meg Murray. Murray also volunteers at IRC, which attracts people from Southeast Asia and Africa as well as the Middle East.